Melin Friendship Group meets up once a week for a chat, a cup of tea and all sorts of activities. We may pop to a local café or for a walk. We are a warm and welcoming group and are open to all. The aim of the group is to give people the opportunity to leave the house and meet friendly people from the area. Our project is about tackling loneliness and isolation in the community. 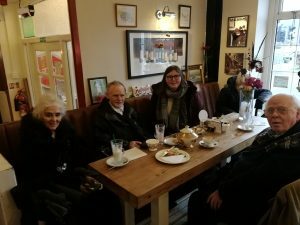 Our community befriending volunteers help members of our group to access other events and groups in the community, helping you fulfil dreams and pursue life to the fullest. Currently we have a group based in Melincryddan, Neath and we are hoping to establish groups across Neath and Port Talbot, so if you would like to see a group in your area we would love to hear from you. To find out more about becoming a Friendship Volunteer and supporting the group, please get in touch with our Volunteer Coordinator, Naomi Hammett at naomi.hammett@neatheast.co.uk or on 07483300773. Melin Advice Centre, 80 Briton Ferry Road, Neath, SA11 1AP.